To understand the origin of elements in the universe is a very challenging quest. There is a myriad of phenomena responsible for the creation and annihilation of nuclei. The lightest elements were forged in the first minutes of the universe and constitute 98% of the matter in the cosmos; the heaviest atoms depend on the curiosity and ingenuity of scientists to be made and exist for less than seconds. Here we will see something in the middle, the nucleosynthesis of elements like gold and ​lanthanides​. The cosmic origin of elements heavier than iron has long been a mystery. Mechanisms such as fusion in the inner core of a star or even supernovae fail to explain the abundance of these elements. They are primarily made in extreme environments that have a high free-neutron density (higher than 102o neutrons/cm3). 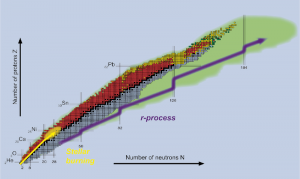 The free neutrons end up bombarding seed nuclei in a process called rapid neutron capture (r-process), creating unstable rare isotopes that subsequently decay into a stable heavy species (Figure 1). Figure 1: Table of nuclides showing stable isotopes in black, and in purple the nuclei generated by the r-process, before β-decaying into stable isotopes. Nothing better to provide such neutron-rich environments than the collision of two – wait for it – neutron​ stars. Neutron stars are one of the final stages that a regular star can reach after running out of fuel. When the initial mass of the star is below ~10 solar masses it explodes into an Earth-sized diamond, called a white dwarf; when it’s bigger than ~30 solar masses it ultimately becomes a black hole. But it is in the middle that things really get interesting — the death of star with an initial mass between 10 and 30 solar masses leaves a neutron star. These exotic objects have the mass of almost two suns in a radius of 10km — a spoonful of neutron star weighs the same as Mount Everest! 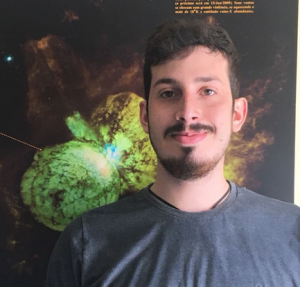 Neutron stars are sustained by the degeneracy pressure of its neutrons according to the ​Pauli exclusion principle​ and have magnetic fields that may be up to one quadrillion times that of the Earth. Nature doesn’t get much weirder than that. Systems with two of these objects orbiting each other start to lose energy in the form of gravitational waves and ultimately collide in an explosion a thousand times brighter than a novae, hence the name ‘kilonova​.’ The ejected mass is constituted of free protons and neutrons (with about 100 neutrons for each proton). When it expands and cools the nucleons will combine, forming α-particles that will fuse together into other light nuclei, starting the neutron capture previously discussed. The unstable isotopes β-decaying creates a radioactive glow that carries the signature of the elements finally created. All of this ​was​ just another theoretical fantasy, but not anymore. In August of 2017 the Laser Interferometer Gravitational-Wave Observatory (LIGO) and Virgo interferometer measured such an event. Briefly after, most of our telescopes were looking at the same point, starting a new type of astronomy called multi-messenger​ astronomy. 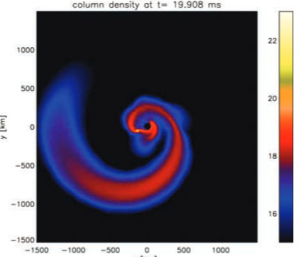 Figure 2: ​Simulation of a tidal tail created by a neutron star-black hole collision. (Rosswoger et al. 2004. Accretion dynamics in neutron star–black hole binaries). The authors of today’s paper explored models motivated by general-relativistic simulations of mergers (Figure 3), identifying two mechanisms of mass ejection (with the ejected mass totaling a tenth of the Sun’s mass). The first mechanism would be a tidal tail (Figure 2), generated by the spaghettification (yes, this is a word) of the stars when they fall into each other. The tails form a very neutron-rich torus where the heaviest (58 ≤ ​Z ​ ≤ 90) elements are created. Then the two objects hit each other at tenths of the speed of light, squeezing matter out by the poles, creating a less neutron-rich region in which the less heavy elements (28 ≤ ​Z​ ≤ 58) are made. The second mechanism of ejections happens seconds after the collision — as matter gets into the accretion disk, winds from the remnant star blow it away. The type of elements forged at this moment depends on what kind of object the remnant is​;​ if a neutron star, neutrinos in the wind will make the neutrons decay, yielding a less neutron-rich environment (scenario a), but if it’s a black hole, the neutron rate remains (scenario b). Figure 3: Schematic illustration of the components of matter ejected from neutron-star mergers.The red regions represent the more neutron-rich areas and the blue represent the less neutron-rich. The authors also modeled how the light curves and the spectra should appear (Figure 4) depending upon the composition of the material. When the heaviest elements are produced in the event (green and red lines) the result is a dimmer, but longer, transient due to the opacity of this kind of element. When the produced elements are lighter, the light curve gets brighter but briefer. Comparing the simulations with the data, the authors oncluded that the merger produced two spatially distinct components of ejecta (as Figure 3 suggests), one corresponding to light r-process elements and the other to heavy r-process elements. They also concluded that the observed light-curve was compatible with scenario b of the figure above, thus implying that the remnant must be a black-hole. Figure 4: ​Kilonova model spectra and light curves. This was just the first measured event, and future kilonova observations may exhibit diversity. For example, if the stellar masses vary from this initial incident, the remnant can change, leaving a very massive neutron star instead of a boring black hole.​ ​This kind of astronomical phenomenon promises a lot of answers to old cosmic questions, beyond the ones it already answered.